After nearly two decades of hard times and the austerity of the war, life is back to normal in January of 1949. Incomes are steady, manufactured goods are available again and there is a new sense of hope as evidenced by the ’48 Woodie in the drive. The veteran ’38 Fordor at the side yard has clearly come to the end of its days. The Fleagle place continues to weather the elements and soldiers on like the 1940 coupe cresting the hill on Charity Pines Road. Maybe the old place will finally see a coat of new paint, the first in a while. The house may be a bit tired on the outside but it’s a warm refuge from the winter chill. And warmth is what we think of with thoughts of home. Mark Sullivan, a friend of the blog, shared some in progress images of his layout that included the one above. I was immediately captivated by the quality of the modeling and how well he captured the rolling southern Ohio countryside in winter. There are many lessons to learn from this scene. Foremost among them is the near absence of flat ground, except where you would expect to find it near the house. Notice in particular how the house is situated above the road and the short but steep incline of the driveway as it comes down to meet the road. Charity Pines Road itself is a study in observation. As it climbs the hill, the road is in a cut that lowers the grade somewhat. There’s a slight crown in the surface that directs rain water to the gravel shoulders on each side. The exposed faces of the cut are well done, although Mark emphasized that the scene is still a work in progress, with more details such as foreground trees yet to come. The composition has a spacious feel to it, even though the camera is in close. This is so rare in my view and adds tremendously to the quality of the scene. The color palette is very restrained yet speaks volumes. 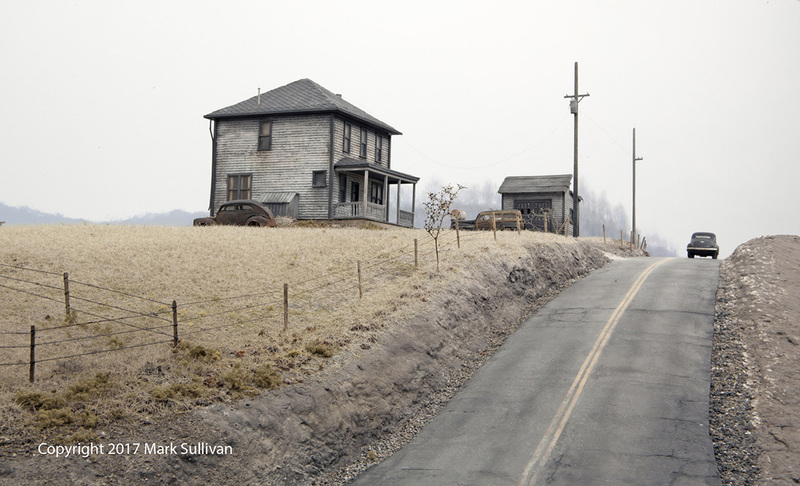 Not many people have the feel for color and atmosphere that Mark does. His eye and hand are clearly present in the modeling by way of the restraint he exercised. Modeling of this caliber speaks with a whisper; it invites you to become a part of the story like I did with the intro. While Mark provided the specific details, the narrative is a figment of my imagination. Did I mention I’m biased? This image checks many of the boxes I find so rewarding, such as the Midwest landscape in winter and fine modeling that’s skillfully executed. His work and approach also embodies many of the themes I speak about here. What I haven’t mentioned is the scale or the shopping list of materials used. That’s because both are completely irrelevant to my enjoyment of this image. This, in my view, is modeling that transcends both scale and technique. I want to thank Mark for his kind words, for sharing his work with me and allowing me to share it with you. I look forward to future updates. The electric transformer and looping single power line to the house really pull you in. This could easily be early March right before an ice storm perhaps. In fact, the leaded sky says it all.